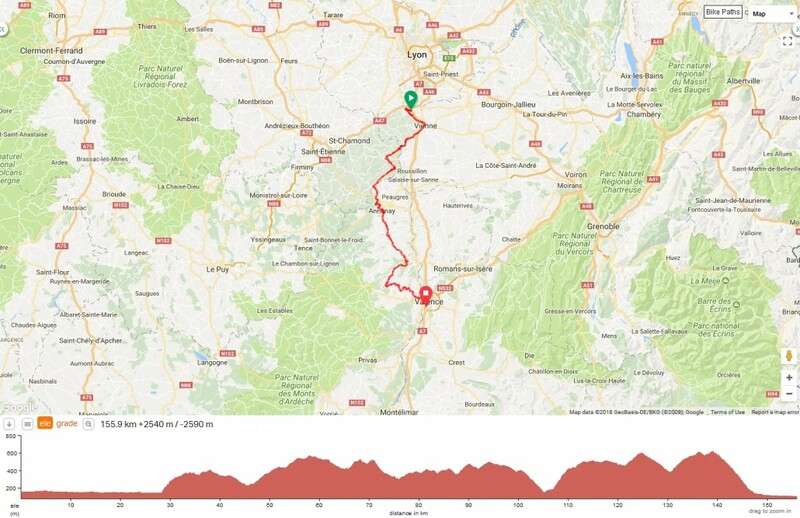 As well as providing three very contrasting days on the bike, this route provides us with a unique impression of both the busy, grandeur of the Rhone valley and wild, deserted spaces that link one wine-area to the next. The route crosses the Rhone a total of six times over the three days and visits the ‘departments’ of Haute Loire, Ardeche, Auvergne/Rhone-Alps, Drome, Vaucluse, Gard, Bouches-du-Rhone, and the Languedoc-Rousillon. All this with barely a stretch of main road and as many quiet back-roads as it has been possible to include, as well as a total of nearly 60km of traffic-free cycle path. 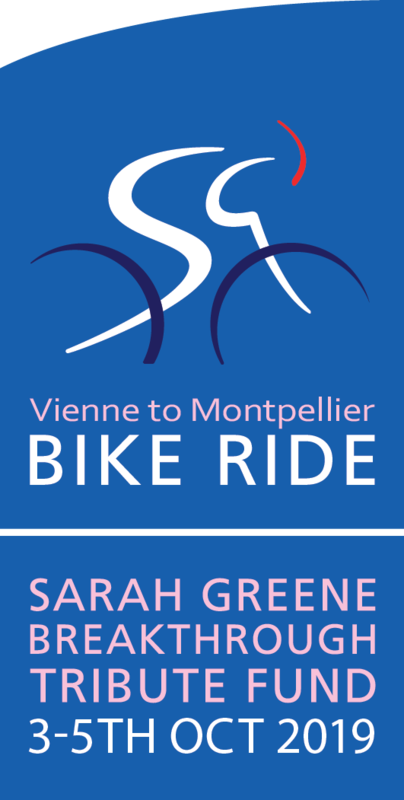 There will be a short coach transfer from Lyon to Vienne at the start and an even shorter one from our hotel at La Grande Motte to Montpellier airport on Sunday 6th October. Our journey starts with 20kms of traffic-free, cycle path along the mighty Rhone river before our first climb through one of numerous vineyards that clad the valley-side slopes. We weave our way through the wooded plateaux of the Haute Loire before we arrive in the Ardeche region. Our first stop will be in the tiny, much-visited medieval village of Malleval. We continue to explore the remote, renowned woods and lakes of the Ardeche, eventually arriving in Annonay where we will stop on the town square for lunch. The afternoon reserves more quiet roads through wild country, with a mix of woods and vines. There are regular climbs but never more than 5 km at the longest and all with an average of 6% at worst! The stage ends with a glorious descent back into the Rhone valley and another cycle path section to lead us onto our next Rhone-crossing bridge & close-by hotel. More Rhone-side cycle path will provide a welcome gentle start to this stage for the first 30 kms. This time we head east to explore the glorious Drome region. More remote vineyards and tiny villages, such as Villereas, where we will stop for another typical French lunch menu. Our afternoon feed-stop will be in another town rich in both medieval and Roman historical ruins : Vaison-la-Romaine. History and wine continue to shape our route on our way to riding right along the foot of the 37-metre high Roman theatre wall in Orange, where we stop for our second night. 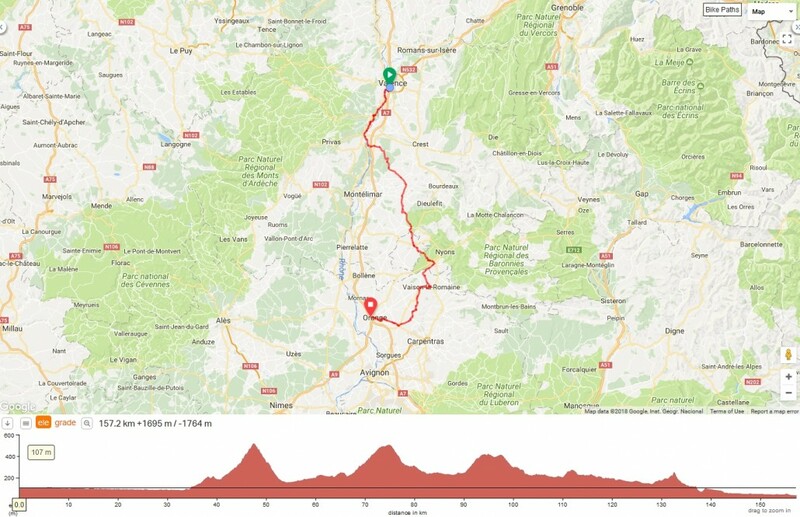 Nearly 1,000m less climbing than stage 1, this stage nevertheless has its steady climbs appearing at regular intervals throughout the day, three of them in particular defining the stage profile. But this stage will allow you a little more time for the occasional café stop ! After another gentle start along back lanes, we head south-west up into the hills of the Gard towards the famous small town of Uzes, where we will stop for our first feed-stop. 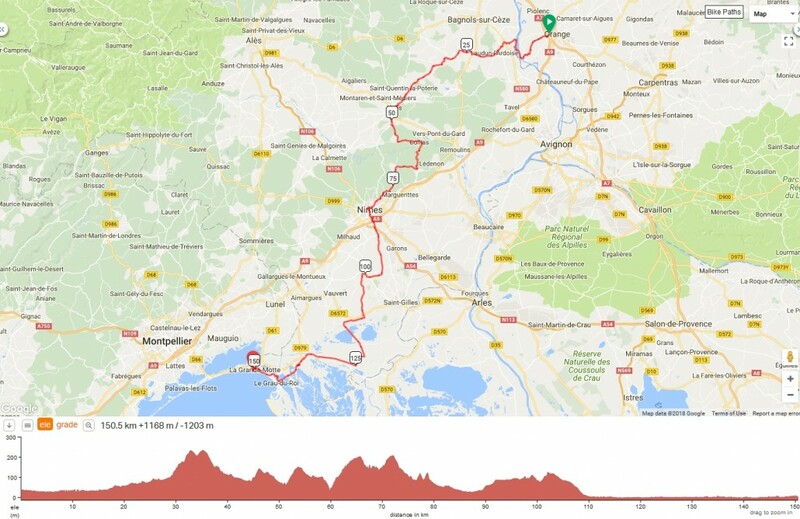 Our route rolls across all of this beauty and then brings us into the very centre of Nimes, where we will have lunch right in front of the extremely impressive Roman arena, where gladiators fought each other way back when, but where ‘mock’ bull fights (Feria’s) are still held. From here, we set out on the final leg of our adventure : out into the pancake-flat wilderness of the Camargue region. Herons, flamingos, wild horses, rice fields and even salt ‘factories’ will provide a unique setting for our journey to the sea. We cross the highly impressive Aigues Mortes, with it’s Norman fortified town before finally arriving at our beach/marina hotel in La Grande Motte, with superb vistas over the coastline.